A new study mandated by Congress in the wake of the secret waiting list scandal at the Department of Veterans Affairs has uncovered significant evidence that the department’s IT leaders have for years failed to meet the technology needs of clinical professionals treating veterans on the front lines and that those IT failures, along with institutional infighting, have left VA care providers with “obsolete” health records and systems. The report, known as Assessment H (Information Technology), was prepared by The MITRE Corporation and is part of a series of independent studies required by the Veterans Access, Choise and Accountability Act of 2014. The 224-page assessment is dated Sept. 1 and had not been authorized for public disclosure when it was posted online. MITRE’s assessment team conducted 185 interviews across the VA’s IT enterprise to produce its report, which found that although there has been some success in limited technology projects most VA clinicians “have become increasingly frustrated by the lack of any clear advances during the past decade” and that many of the most important IT initiatives started during the past decade have stalled because of faulty management or outright infighting between VA’s Office of Information and Technology (OI&T) and the Veterans Health Administration (VHA). The biggest indictment in the report focuses on VA’s overall management of its main electronic health record system, known as the Veterans Health Information Systems and Technology Architecture (VistA). 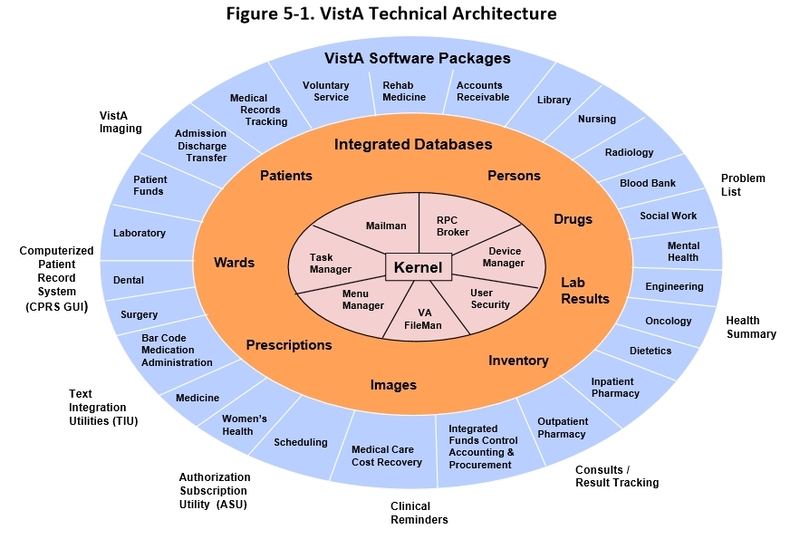 Although the scheduling module was at the center of the scandal involving secret waiting lists and veterans dying while waiting to receive care, the VistA system is a massive collection of functional modules that have evolved independently over more than 30 years. There are now more than 130 distinct instances of VistA in use across the country. 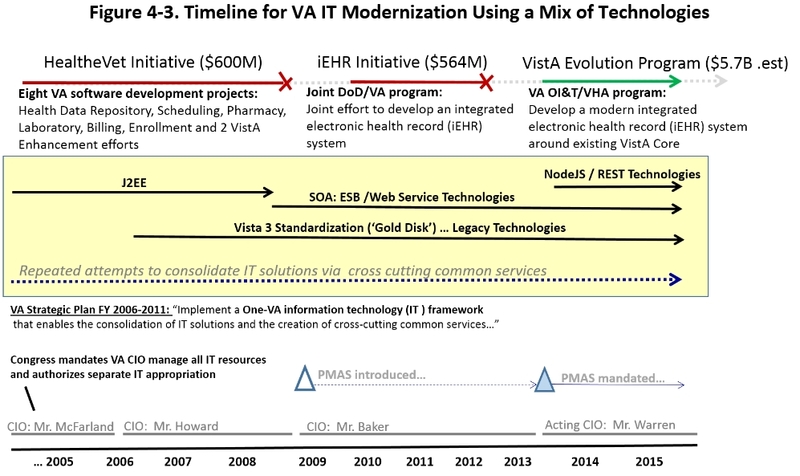 And while VA is expected to award a commercial scheduling replacement system contract in 2016, the massive VistA architecture remains an outdated mess, according to the report. The MITRE report takes aim at VA’s Project Management Accountability System (PMAS), which was introduced in 2009 to improve delivery of IT systems by forcing VA developers to adopt modular approaches that deliver functionality within six months or less. Although this so-called agile development methodology was championed for years by former VA Chief Information Officer Stephen Warren, developers throughout VA told the MITRE investigators that the PMAS process had many problems. “VA naturally considers the delivery of useful capability as the primary metric for agile software development. However, during Assessment H interviews, 36 planners, builders, and users provided unsolicited insights suggesting that an over-emphasis on schedule diminishes the incentive to deliver working software demonstrably suitable for its intended purpose,” the report states. The MITRE report also blames management failures and the inability of senior leaders to cooperate on IT strategy for most of the technology problems that now plague the department. “Many Assessment H interviews revealed perceptions that a risk-averse culture and a lack of trust between OI&T and VHA undermine effective collaboration. Of the 185 individuals interviewed, 88 (or 48 percent) volunteered statements that indicated some degree of discord between OI&T and VHA. These perceptions apply equally to both VHA and OI&T leaders,” the report states.